In our little corner of the Internet, the answer to that question is, more often than not, a foregone conclusion: yes, duh. We’re all so desensitized to the thought of paying $1500 and up for a bag, even if you’ve never done it yourself, that sometimes I honestly forget that the vast majority of the population experiences sticker shock when confronted with how much a Celine Luggage Tote or Proenza Schouler PS1 costs. When the Luggage Totes first hit stores for $1750, I remember remarking to Megs that it sounded like a good deal. The problem isn’t just price, though; it’s also ubiquity. For your bag money, do you also want to be unique? When a beautiful bag that you’ve always loved reaches a certain point of saturation, does it become less desirable to you, or do you buy what you love in spite of what other people are carrying? Earlier this week, Buzzfeed fashion editor Amy Odell took to the Internet to express her frustration with the idea of spending four figures to carry a distinctive bag that everyone else has. She’d rather carry a designer bag that’s distinctively unique, but is Odell just trading one kind of status for another? This subject is an interesting one, and Amy Odell is an accomplished writer and member of the industry, so I’d recommend reading her thoughts about the issue in full. In the post, Odell makes a few assumptions: first, that the main compulsion behind the purchase of an It Bag is the desire to impress others who are also “in the know,” second, that carrying a widely coveted bag automatically makes people wonder whether or not its fake, and third, that It Bags are always highly recognizable. Based on my experiences with the luxury accessories industry, I don’t think any of those assumptions are true, or at least not always true. I’m the first one to admit that status is an enormous motivating factor for many people, maybe even most people, when it comes to buying handbags. Unlike a dress or even a pair of shoes, bags sit in front of an outfit and are often something that can be carried day in and day out, which makes them a particularly cost-effective (as opposed to, say, a full wardrobe of Rick Owens) means of conveying status. Not to mention that status is a powerful psychological drug – the difference in how people treat you when you’re dressed expensively versus shabbily is often enormous. That only increases when the bag you’re sporting is notoriously hard to locate; people assume you have an in somewhere, salespeople assume you must be a big spender, fashion people judge you favorably. It can be almost intoxicating to see yourself in the reflected glow of your fancy handbag. What the irritation with that phenomenon seemingly doesn’t account for, though, is good design. Luxury brands with huge design departments and nearly limitless resources fail at making It Bags season in and season out; to become an It Bag, a design has to catch, and that generally happens before a bag is widely known and impossible to purchase without a lengthy wait list. 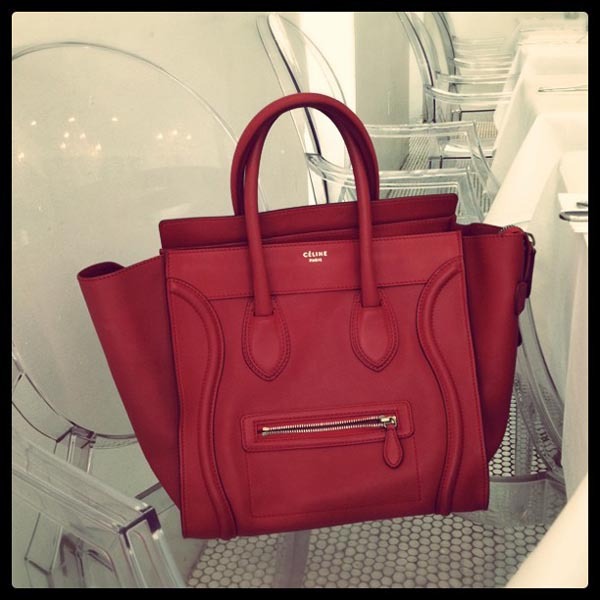 Way back in the first days of the Celine Luggage Tote, I remember seeing them both sitting on store shelves and available for purchase online. It had a magnetism to it then, too, long before it reached its “it” status. The reason the Luggage Tote was successful was because when I saw it sitting on those shelves for the first time, a little lightning bolt went off inside my brain, and I’m not the only one who had that experience. It looked fresh, distinctive and incredibly luxurious. As much as brands wish that a hit like the Luggage Tote could be all about marketing, it’s just not. An It Bag can’t exist if something about it doesn’t speak to buyers beyond its potential to convey status, and Odell’s line of thinking doesn’t take into account that even people who aren’t concerned with telegraphing status might just really love how an It Bag looks. Odell’s alternative is to buy something that she considers unique and subtle, but within the realm of premiere designer handbags, I’m not sure that truly exists and Odell, for her part, doesn’t list any specific examples. Not only do all major brands foist their bags to the front of their advertising, hoping that something will catch, but when the Luggage Totes first surfaced, they were unique and subtle. Celine was at the very first stages of its rebirth under Phoebe Philo, the bags were only available at small luxury boutiques, the now-ubiquitous flared gussets and curved front piping didn’t have any particular association for most bag lovers. The most common version at the time? Basic black matte leather. Today’s subtle classic is tomorrow’s It Bag. Uniqueness, too, has its own kind of status within the fashion industry. Having something that’s totally chic but not immediately recognizable tends to engender as much attention from people “in the know” as the bag of the moment, mostly because it makes people think you’ve somehow gotten one up on them and they’re hungry to know if you’re aware of something they’re not. Among bag people, finding a bag that gets that kind of reaction might actually be more work than tracking down an It Bag, and it’s likely to cost just as much. Is that lustful reaction to uniqueness qualitatively different than it would be if it happened because of a bag that everyone already wants? I’m not sure that it is. Of course, all of that assumes that the vast majority of people who buy It Bags live the kinds of lives that regularly bring them in contact with people who can recognize a Celine or Proenza bag on sight, which simply isn’t the case. Our forum is full of literally tens of thousands of members who live in places where no one is likely to take a second look at their Luggage Totes or PS1s, and still, they find themselves drawn in. Outside of major urban areas with fashion-conscious populations, the issue of recognizability and status almost entirely evaporates, beyond someone simply noticing that you’re dressed nicely. Odell seems to have internalized a bit of New York exceptionalism; we’re not the only ones who buy expensive bags, not by a long shot, but the fear of a non-logo bag being too recognizable is indeed unique to NYC and a small handful of other places. The scarcity of Celine bags can’t be attributed to shoppers on this island alone, so people must be buying for reasons beyond what amounts to fashion exhibitionism. I bought my first It Bag, a Balenciaga Motorcycle Bag in the mid-2000s, while living in a rural Georgia town of about 125,000 people. No one in my town ever recognized it, as far as I know, and even when I went to Atlanta, it was only employees at Neimans and Saks that seemed to care. Telegraphing status is a very limited thrill when no one around you cares to receive the message, as is the case with the daily lives of a huge number of luxury handbag buyers. And then there’s the issue of fakes. Odell asks why someone would spend a ton of money on a bag if everyone might think it’s fake, which is a question that honestly caught me by surprise in this context. I’ve heard people make the same complaints about Louis Vuitton monogram bags, which are the most widely counterfeited in the world, but about a Celine Luggage Tote? What kind of insecure person is going around convinced that every Celine or Proenza bag they encounter is a fake? People used to ask me all the time if the Louis Vuitton tote I carried during college was real, but I’ve never heard a peep of curiosity from anyone about anything non-monogram in my collection. I’m tempted to say that it’s a concern that exists entirely in Odell’s head, but even if it doesn’t, the thought wouldn’t come close to entering my mind when trying to decide whether to spend thousands of dollars on something I love. What’s that saying again? Oh yes: haters gonna hate. If a stranger thinks my PS1 might be fake, that’s their problem, not mine. I do think that Odell makes a couple of good points, though, namely that it’s not much fun to carry exactly the same thing as everyone else you encounter. Because of that, I tend to prefer bright colors, prints and nontraditional materials when I’m picking which version of a bag that I want. Not only do they fit my personality better, but they relieve a bit of the ubiquity. As for the question of worth, I think that’s entirely personal; $1500 means a whole host of different things to different people, and how much it means to you is a personal decision. When people ask me for my opinion, I generally tell them that if they love the bag and they think they can honestly afford it, they should buy it, regardless of prevailing trends or the bag’s relative popularity. You, after all, are the one who has to carry it.